← Some things make you reconsider your choice of work. 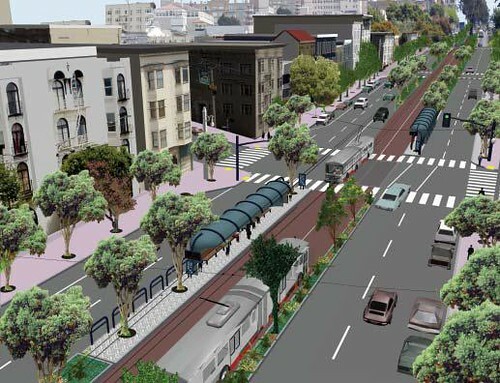 What if the Van Ness BRT wasn’t run by MUNI? But, this begs the question. Will the Van Ness BRT line go down with a fanfare of failure just like the abysmal T-Third line? MUNI’s strong suit isn’t implementation. Frankly, I don’t think MUNI has a strong suit. What if MUNI were to not implement this line and instead contracts were offered to private entities to operate the line? Of course, this would never happen give the structure of the city agencies, but work with me. Imagine: the Van Ness BRT line run as a separate entity given clear performance goals, free of unions, horrible bureaucracy, and general incompetence. How well would a private company operate this line? Answer: very well. Look at Google’s implementation of its free commuter buses for its employees. The instant Google sees trouble with Bauer’s performance delivering its highly paid employees to work safely and on-time, Bauer’s is out. The City has no option like that. MUNI can’t be ‘fired’. Maybe that needs to change. This entry was posted in politics, transit and tagged accountability, bus, busses, enforcement, local, management, muni, operators, out-source, outsourcing, partnership, policy, private, privatization, public, public private partnership, regulation, source, transit, transportation. Bookmark the permalink. 3 Responses to What if the Van Ness BRT wasn’t run by MUNI? the thing is, we’ve tried a private system before (at one time we had 4 companies + MUNI running trains and whatnot around town). the thing is, there’s really not a lot of money to be made running transit systems that serve the entire public evenly. one of the biggest problems the old private railway had during the war was that due to shortages they began to cut service and raise fares, making it difficult for war workers to get to work. when they were asked to increase service the standard response was that they had no obligation to the war effort, just to shareholders. This was one of the reasons they ended up being absorbed by MUNI . It is also why we have so many duplicate lines. much of MUNI’s work is outsourced already – most of the studies being done for the TEP and peformance are done by outside companies, and obviously construction. the real disconnect is that too often they look for the cheap way out so they don’t have to ruffle the public’s feathers instead of being honest about what’s needed. That’s why the T line was such a SNAFU – they chose to fiddle in the margins and make something that looked good on PAPER but had no basis in reality. I agree that outsourcing alone is not an “end-all-problems” solution; it’s just an option to consider. It seems the main failure is inability to set and achieve reasonable goals that serve the transit needs of the community, wether or not those goals are achieved purely with public entities or some sort of public-private partnership.